Whether you are running for fun, fitness or running a marathon you put yourself and your feet under great stress. On average you put six times your bodyweight through each foot when running which can maximise any minor or major potential problems significantly! Pain is the body’s way of letting you know something is wrong. Listen to your body and act on it! Training can cause normal aches and pains called Delayed Onset Muscle Soreness (DOMS) and is a normal response from muscles repairing themselves after training. This typically occurs one to two days after a training session and only lasts a couple of days. An injury is typically something that does not go away and causes you to stop or reduce your training. This is pain in and/or around the front of the knee or knee cap. This typically is worse with repetitive bending of the knee (i.e running) and going up or down stairs. Pain typically on the outside of the knee this is often an overuse injury with a tightening of the band of tissue which runs down the outside of the thigh and inserts into the outside of the knee. 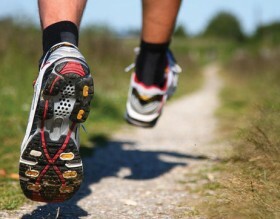 Pain occurs as the foot hits the ground when running due to the increased angle of the leg. An overuse injury involving the tendon at the back of the leg and foot, which can occur gradually. Early treatment is recommended with Rest, Ice, Compression and Elevation (RICE) and addressing any mechanical abnormalities that are present. Medically known as Medial Tibial stress syndrome, this a pain that occurs either at the front or inside of the shin which typically improves once you have warmed up and then is painful the following morning after exercise. A mechanical malalignment in relation to lower leg and foot can be a big influence in the cause of shin pain and this should be addressed. Most commonly presents as plantar fasciitis, this usually happens when standing up first thing in the morning or after a period of rest which can improve as you warm up, but then gets worse the more activity you do. Podiatrists are in an ideal position to treat this, as orthoses can reduce the stress on the band of tissue under the foot. Here at The Foot pain centres of Leeds we can help all running injuries,book in today and feel the difference. Keep your feet clean and dry to prevent blisters. Ensure you shower and dry your feet thoroughly after you have been for a run to prevent athlete’s foot. Change your trainers every 500 miles. Get these fitted properly to suit your foot type. Warm up before you run. If running for the first time, ensure you get a Biomechanical assessment. It is essential to get the correct footwear as this is vital to keeping you injury free and at peak performance. There are a number of companies that make ‘functional footwear’ for running rather than fashion-based footwear and a multitude of trainers with differing amounts of support to suit different foot types.